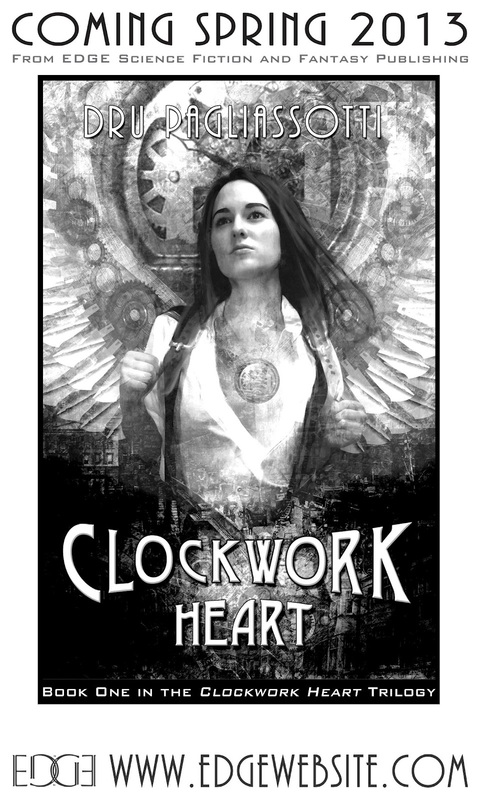 So I read and fell in love with Dru Pagliassotti's Clockwork Heart back in 2008 when it was first published. I've followed Ms. Pagliassotti's blog ever since, anxious to see what she would write next. I was surprised and delighted to hear she was at work on a sequel. Even though it's perfectly lovely as a standalone, it's also one of those instances where I will always be up for spending more time with these characters. And definitely in this world. From page one, I was enamored of Ondinium, its elaborate social strata, and its gorgeous steampunk trappings. And I just never get tired of the phrase "metal-winged icari." So it was with all kinds of excitement that I saw this ad for the trilogy, to be published by EDGE. They're republishing Clockwork Heart in March of next year. It will be followed by the second book in September and the final book in the trilogy the following March. Word is they're keeping artist Timothy Lantz on to do the covers for both sequels, which thing maketh me exceedingly happy as the original cover has long been one of my favorites. Huh, never heard of this, but that is gorgeous art. Isn't it, though? I remember picking my copy up at our local Borders (*sob*) and just admiring the general splendor. 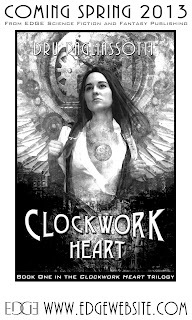 Oh wow, I LOVED Clockwork Heart! I'm definitely looking forward this. Thanks for the heads up! Ooh, goody! Happy to spread the good news. DYING of happiness. But we have to wait a YEAR for book 2. But there WILL be a book 2! I'm glad to hear this, because when I went to look for Clockwork Heart on Amazon, I found it out of print. So, I'm glad it's coming back! Yes! Never fear. It will be available again soon. Woohoo! So glad they're reprinting this, much easier to pimp a book when it's available, you know? And there will be sequels! Lol. So true. And it's just so enticing, the thought of a sequel to a book you read a few years ago and thought that was it.